I am a 49-year-old happily married mother of two and a doting grandmother to two wonderful little grandsons. I felt really lucky until the summer of 2013. I had a nice home, lovely family, great friends and life seemed pretty perfect until I began to experience excruciating burning pain in various parts of my body. 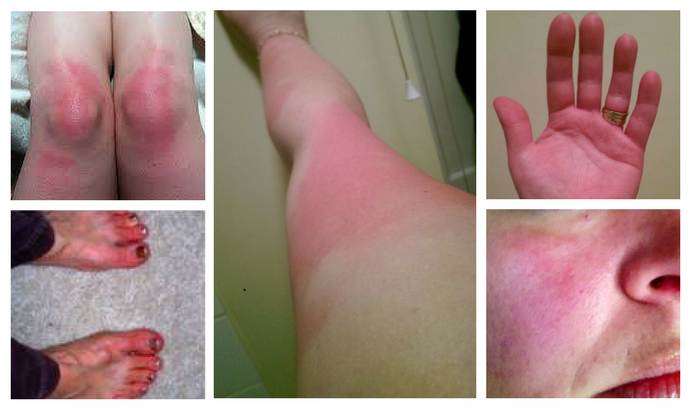 The worst were my legs and knees, which were incredibly swollen, painful, bright red and warm to the touch. The soles of my feet and my toes felt like they were on fire, like I was walking on a very hot sandy beach. An intense pricking heat travelled down my arms to my hands and fingers, which would tingle and turn numb. The only way I can describe this wicked pain was that it felt like I was being branded with a hot iron. In desperation I would get under a cold shower several times a day and I'd try to cool myself in between with ice packs and fans. Most of my day was spent lying on the bed sobbing. My entire body felt like it had been set on fire. I lost count over the number of times I saw my GP and begged him for help. At first, he didn't believe me. He thought my symptoms were psychosomatic and, given my age, due to the perimenopause. He even sent me to see a psychologist in order to deal with all these supposed imaginary symptoms. Over the months my pain worsened and the burning episodes became intolerable. Things came to a head when I could no longer perform day-to-day activities like shopping, exercising, housework and cooking for my family; even my ability to walk was severely affected. I was a physical and emotional mess. I made yet another appointment to see my GP. Because I had been met with such disbelief in the past, I went armed with a folder full of photos that clearly showed my red, swollen skin (see above). They say 'seeing is believing' and this time he took one look at the photos and referred me to a neurologist immediately. By the time my neurologist appointment came through I had spent hours searching online health sites and pretty much diagnosed myself as having a rare neurovascular condition called erythromelalgia (EM) aka 'burning man syndrome'. The neurologist I saw was a kindly compassionate man who actually listened to me. First, he ran some nerve conduction tests and performed a skin punch biopsy, diagnosing me within two weeks with small fibre neuropathy. Although he had never seen or even heard of erythromelalgia he looked at my photos and sought advice from a colleague who informed him that some people with small fibre neuropathy can develop a burning syndrome called erythromelalgia. He sent me for numerous blood tests to rule out other possible causes for my burning pain (like autoimmune conditions) and a Doppler ultrasound (for disorders such as vasculitis and arterial diseases) and, almost three years after my nightmare had began, I was officially diagnosed in 2016 with small fibre neuropathy and secondary EM. I have since been diagnosed with erythrocythemia as well (an increase in the total cell mass of the blood). My treatment for this condition consists of therapeutic phlebotomies (bloodletting) every month to reduce my red blood cell count and blood volume, which is bloody awful (literally!). For the small fibre neuropathy and EM it is really just trial and error trying to find a medication or medications that might help a little. I currently take gabapentin, tramadol, amitriptyline and I also use a numbing lidocaine cream. Do they help? No, not really, but I am luckier than some. I have a proactive and compassionate neurologist who tries his best and has even prescribed me a novel compound cream containing midodrine, specifically developed for erythromelalgia by the Mayo Clinic (USA). In the space of a few years I went from being a healthy, outgoing, fun-loving person to an introvert who cannot even go outside or play with my grandsons! I can no longer be the caregiver I once was for my husband who suffers from multiple myeloma. I can no longer work and I struggle to homeschool my son because the amount of medication I need to take leaves my brain foggy. I am constantly tired as the nocturnal burning is so severe it keeps me awake. I am sad and grieving. The person I used to be has died and I find it hard to accept the person I am becoming. I can't tolerate clothes touching my skin or even wear shoes as they trigger a flare-up. I used to be really well-groomed and prided myself on my appearance but now I feel too exhausted to even bother, plus I feel too damned ill anyway. I actually didn't think things could get any worse but I'm suffering facial flare-ups now too, and losing my hair. I don't think anyone truly realises how systemic erythromelalgia can be. During my internet searches I had stumbled across an incredible UK-based organisation called The EM Warriors: Erythromelalgia Patient Support and Information Network. They truly empowered me, informing me all about erythromelalgia and its comorbidities and sending me loads of information on medications to share with my doctors. They even organised free genetic testing for me. I think my best advice to anyone who thinks that they might have EM is to take plenty of photos. As we often look normal in-between flare-ups we are usually met with disbelief – even from experienced medical personnel. Another tip I learnt was to trigger a flare in front of the doctor by putting an affected hand or foot under warm water. To those who have been diagnosed with EM, I found that getting to know my personal triggers and being proactive with cooling really helps. For example, I stay away from heat, pressure and spicy food and I never sit outside in the shade to watch my grandsons play in the garden without an ice pack and a hand-held fan. Because of EM Warriors I was able to be my own advocate. These outstanding individuals genuinely care. They inspired me to want to give back so I started volunteering with them. It feels good being part of something so incredibly special – helping others like I was helped. The EM Warriors have written a Cloudy guest blog post with lots more information about erythromelalgia and the support that is available.